Having a love/hate relationship with “The Hunger Games”. Just loving the depth and interest of the story, but hating the kids dying. I guess that’s the sign of a great book; literature that arouses strong emotions in the reader. Doesn’t help being a parent of kids in that age group either. And I would tend to think her reaction to The Hunger Games is a common one whether you are a parent or not – what kind of country sends teenagers, still children really, to die as tribute for their ancestors rebellion? In the Hunger Games a corrupt society in Panem, and its capitel city ‘the Capitol,’ has control over 12 districts. Each of these districts has some type of industry that the Capitol needs in order to maintain a lavish lifestyle for their citizens. Every year one male and one female from each district are chosen at the ‘reaping’ to compete against each other to the death in an arena controlled by the Capitol, its president (President Snow), and the ‘gamemakers.’ There are several themes that are predominate in The Hunger Games including the theme of a love triangle, a lavish and fake society, and most importantly the theme of rebellion and subsequent oppression. These themes stir up emotion and create strong feelings in the readers and viewers of The Hunger Games. The love triangle (between Peeta, Katniss, and Gale in The Hunger Games ) is one of the most common plot lines, found in many movies and books; yet every time the love triangle theme is introduced people seem to become entranced by it, such is the case in The Hunger Games. While Katniss has grown up with with Gale and knows there is love of some kind between them, she must also consider Peeta as a potential partner when he announces his love for her at the interview before the Hunger Game’s competition. She also realizes that in order for her and Peeta to survive in the games she must act las if she loves Peeta even if she does not. I tend to think that Katniss herself, is not sure whether she does or does not love Peeta. The reality of her situation, fighting for her and Peeta’s life in the game, is influenced by the fact that she discovers, Peeta has always loved her, since he wasy a small boy. Still, a part of Katniss is always thinking about Gale her best friend, the guy who takes care of her family so they will not starve, and the guy she is more than friends with. I have not finished all three books yet so I do not know who Katniss eventually chooses – Peeta or Gale, but I think Katniss does find there are two important differences between the boys. While Peeta only wants for Katniss and him to survive the hunger games and not become a part of the Capitol’s decadent, wasteful, and violent lifestyle, Gale (we later learn) has no qualms about fighting back against the capitol’s evil. The same violent and oppressive way the Capitol treats District Twelve and other districts, Gale would act that same way against the capitol; an ‘eye’ for and ‘eye,’ so to speak, even at the cost of other Panemian’s lives. (Though I do agree more with Peeta’s way of seeing the situation, Gale is in my view “hotter” than Peeta so I hope Gale learns some morals before it becomes too late for him, and he loses Katniss). Another important theme found in The Hunger Games is the theme the of the lavish lifestyle and narrow-minded views taken by the people who live in the Capitol. The people in the Capitol are characterized by Collins as having, colorful costume like clothing, artfully done makeup, and surgically altered bodies, to demonstrate their fakeness. They are empty shells without morals only wanting to be entertained. As long as they can live their expensive lives supplied by goods and services from Panem’s districts, they choose not to acknowledge the violence and inhumanity of sending twenty-four teenagers out to fight to a bloody and horrific death out in the hunger games. The Capitol’s citizens give up their right to govern justly or democratically by overindulging and letting President Snow do as he likes. In fact, the people of the Capital have a hunger for violence and drama at the expense of human lives. They do not understand that Katniss, and Rue, and even Cato, are people just like they are -still human beings. Just because the district citizens toil for resources for the Capitol they are still no different, and should not be treated any differently than the Capitol’s people. Although, I did enjoy the interesting costumes and grooming habits of the people in the Capitol, it made me angry that they would turn a blind eye to the injustice going on around them, particularly, at the hunger games. So that is my take on The Hunger Games and its major themes – the themes of a love triangle, a lavish society, and a oppressive government. I hope seeing the movie and reading the books helps everyone to consider why we must make sure that we to do not become blind to what is happening in our own government and the effects that oppression can have on people everywhere. Everyone here in Canada and United States at least, have the right to choose are governments and have the responsibility to stay involved in how our country is run. The Hunger Games may only be fiction, but it encourages us to not focus on the pursuits of power or luxury, but to put our faith in and to help, and spend time with ‘people,’ who always matter. We have the moral obligation to care about each other, to not discriminate, and to take off our ‘blinders’ so we know what is going on around us, and have the courage to stop a practice when it is wrong. 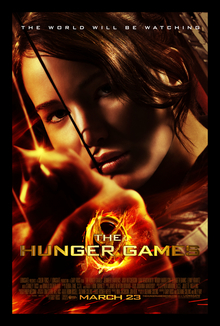 I watched the hunger games at http://watchthehungergames-online.com, it was awesome! I really enjoyed “Hunger Games”! I mean the movie held the entire audience, I was a part of, hostage for over 2 hours. I don’t remember seeing a single phone light up, hear a word of conversation, and (I have to admit) there was more than one time I forgot I was in a theater with others around me. It was just that good. We were all laughing, crying, yelling, cheering, and enjoying at the appropriate times. I understand there are 3 books – I would like to see the others made into movies. Also, as a side note, I want to put in a plug for “John Carter”. Excellent paperback series done well this time.